However, it didn’t stop some players making a real mark over the course of the weekend. Here are the men who did the job at both ends of the pitch. In a match that was meant to be anything but a defensive stalemate – with the Jets looking to move into serious top six contention – the goal keepers should have been bombarded and beaten on numerous occasions on Sunday afternoon. As it turned out, the scoreless result featured limited attacking play and a duo of resolute defences that played with a clear sense of pragmatism. In saying that, Moss was excellent for the Jets, orchestrating his back four well when the Reds did manage to threaten and he continued his superb form of the last six weeks. Playing football in a competitive and professional league is hard enough, doing so with a raccoon on your head is another achievement all in itself. Grant has returned from a serious knee injury this season, done well for the Socceroos and now must surely have proven himself as the best right back option for the national team going forward. The 27 year-old gave the Phoenix defence all sorts of trouble at Campbelltown Stadium on Saturday. His sweeping runs down the right were particularly damaging in the first half. There was a clear determination in the eye of the young defender when the Victory lost Georg Niedermeier after 17 minutes on Saturday night. 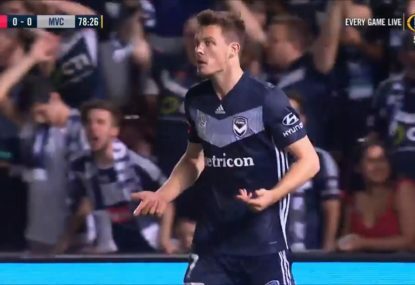 The German had left his team open for a crushing derby defeat and hanging on for 70 minutes with just ten men appeared a tough challenge for Kevin Muscat’s team. 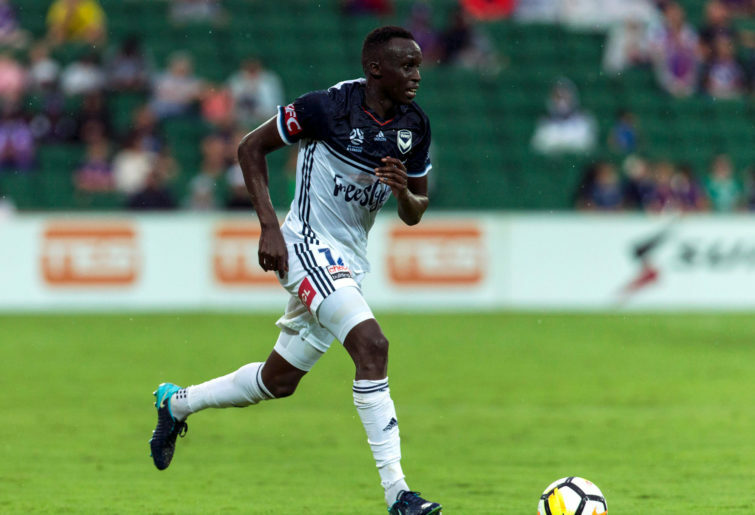 However, Deng took on the task with aggression and composure and the City fans left Marvel Stadium wondering just how they had let two points slip away. Deng will be a rock in the Socceroos defence for years to come. 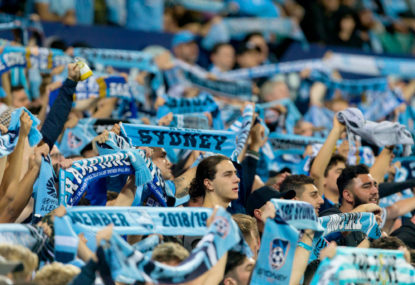 Despite Sydney FC enjoying the better chances and looking more structured and dangerous on the edge of the opposition box, the Phoenix defence resisted wave after wave of attacks. 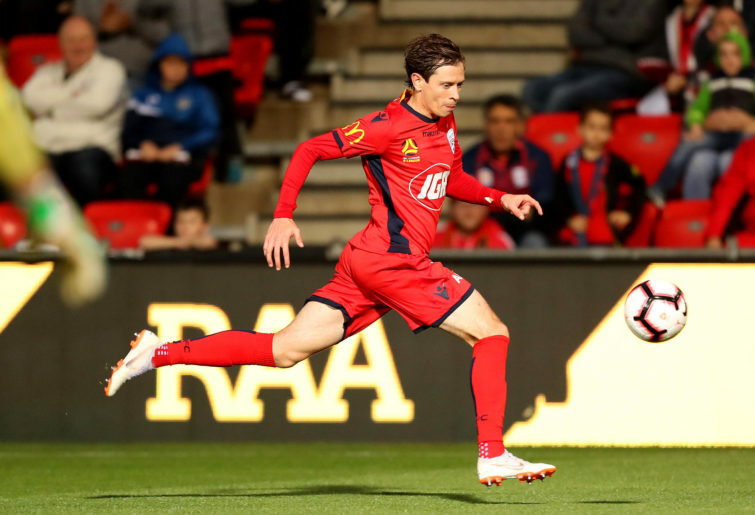 Durante was stoic once again, as he continues to compile one of his best seasons of A-League football. It was only a poorly timed challenge from Filip Kurto that separated the teams, after a crisp ball from Milos Ninkovic was defended well by Durante to seemingly defuse the situation. Sadly for Wellington, Kurto lost his cool and gifted a goal to Sydney when the danger had been averted. In a match where the Jets seemed likely to throw all bar the kitchen sink at the Reds and claim a victory to move into serious top six contention, the reality proved far from the expectation. It was a defensive contest that, midway through the second half, became more about the protection of a point than a desperate search for victory. 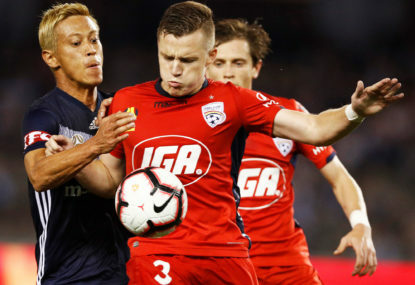 Georgievski was superb, particularly in the second half as Craig Goodwin and Jair raided his wing and threatened to capitalise on the space they created. That space was shut down time after time by Georgievski and it was one of his best games for the season. At the core of Sydney’s season is the quietly spoken defensive midfielder. It was another polished display from O’Neill; full of astute decision making and subtle touches that helped release the Sky Blues into many attacking situations. The Perth-born 24 year-old is a fascinating player to watch in isolation (something I did on Sunday morning) and his quiet presence in the middle is created by his keen football brain and ability to drift effortlessly from contest to contest. Two cracking goals and a skilful performance through the centre of the park will have the Roar fans wondering just where this form has been. Lopez was terrific against the Mariners and while Matt Simon may have provided the most entertainment value on the night, Lopez was the creator and distributor in many of the Roar attacks. There were plenty of them, on a night when eight goals were scored and at least six others should have been. It is no wonder neither the Mariners nor Roar centre backs earned a spot in the team of the week. 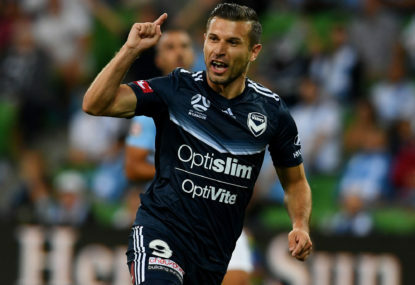 If you don’t like watching a certain little ageing Spaniard play A-League football, I don’t know exactly what is wrong with you. 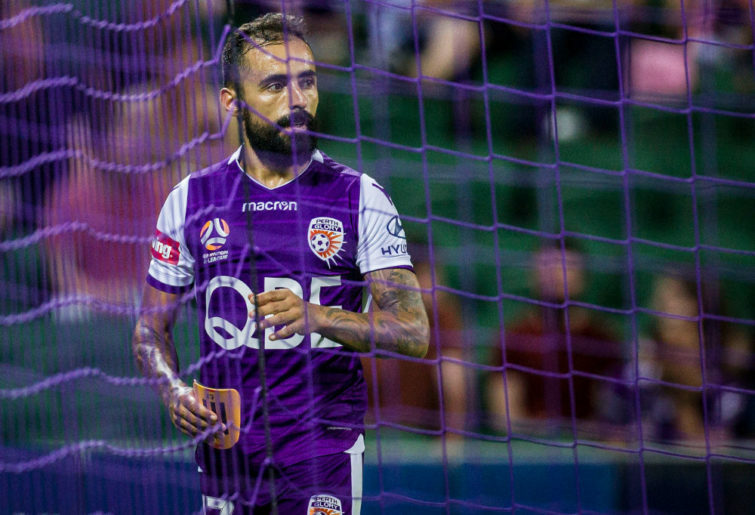 The 36-year-old has done it all in the league and has nothing to prove, yet still manages to produce absolute quality on a weekly basis for the Perth Glory. 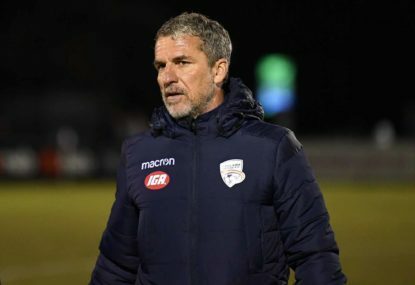 The men from the west look like A-League champions at this stage of the season and after another masterful display from the little general, it is hard to mount an argument for any other side. Although Tarek Elrich did stuff up their Sunday night by snatching a late point. 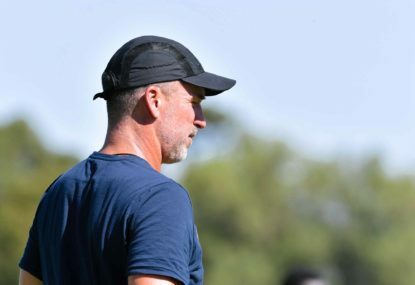 Even putting aside the woeful ball movement of Melbourne City throughout the season and their tendency to hit reverse rather than put the offense in gear, the difference since Maclaren’s arrival has been noticeable. It will not just be the goals he scores (three in three games already) but also his runs off the ball and in behind defenders that will make City a much more dangerous proposition. Georg Niedermeier looked spooked early on and after a reckless foul, brought Maclaren down a second time to earn an early shower and give City a lead. Playing with a true nine puts levels of pressure on opposition teams that City have been unable to apply for much of the season. It seems somewhat strange to have a number of players from a 0-0 draw in the team of the week, yet Goodwin was the best player on the park by the length of the Flemington straight when the Reds took on the Jets. His raids down the left flank should have brought at least one result for the Reds and when he drifted more centrally, the danger he presented did not lessen. After an overseas stint at Sparta Rotterdam, it is getting more and more likely that the speedy winger will be off on another adventure fairly soon, such is his impressive A-League form. The Phoenix may have stumbled against Sydney on the back of a goalkeeping moment of madness, yet their form remains strong. Williams continues to present up front and provide so much variation in the Wellington attack. The 30 year-old returned from Hungary with a few question marks on his potential contributions to the A-League. 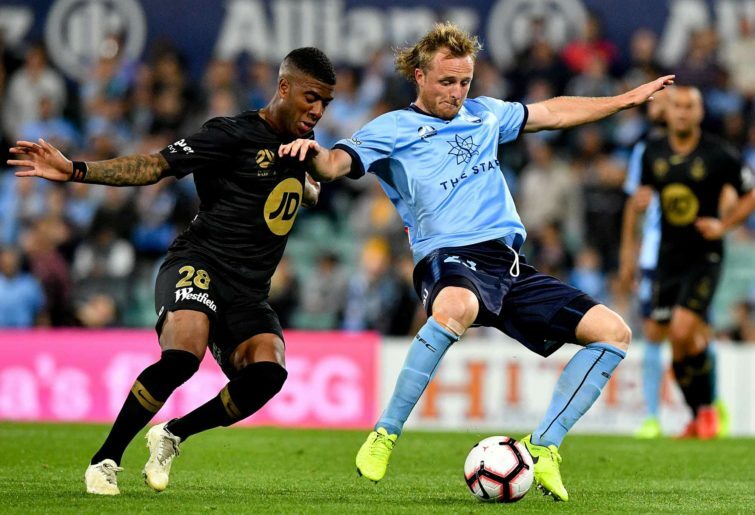 Six goals later, Williams has made a valuable contribution and was the most dangerous man up front for the Phoenix on Saturday night against the Sky Blues.